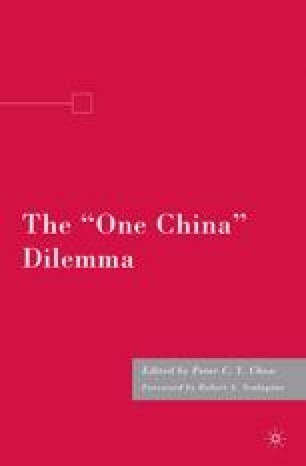 The China-Taiwan-US relationship may for analytical purposes be conceived as a “strategic triangle”1: It is “triangular” in the sense that each bilateral relationship is contingent on relations with the third power; it is “strategic” in its prioritization of the security dimension; indeed, one of its most striking features has been the relative irrelevance of changing economic variables in the strategic balance. In this respect it superficially resembles the Great Strategic Triangle (GST) between the United States, People’s Republic of China (PRC), and USSR. But what we might call the Taiwan minitriangle is otherwise quite distinctive—the imbalance of power among the three actors being only the most obvious. At least, since the end of the Cold War, the United States has been the consistent pivot of this triangle, on the one hand due to its disproportionate economic and strategic weight, on the other because of the (relatively) disinterested “swing” role it has played in determining the relationship between the other two.2 Washington has throughout the postwar period consistently been the principal guarantor of Taiwan’s national security, and during certain crucial periods the United States has also interceded on behalf of China’s national security (while at many other times it has been the main threat to PRC security). These asymmetrical interdependencies—Taipei’s need for US support to retain its independent existence, Beijing’s need for tacit US support to be able to pressure Taiwan, Washington’s need for a balance between the two in order to retain its advantageous pivot position—have locked the three together in a complex, ambivalent embrace.